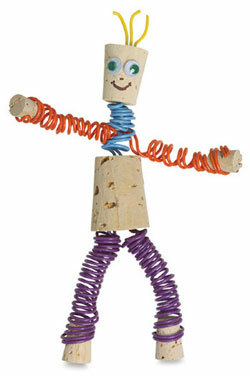 This wine cork man is made with wine corks and colored wire. He is so cute and very easy to make. You can make him in just a few hours. Some people call him a scarecrow and some call him a clown. In my opinion you can call him anything you want to. There are many different wine cork crafts that you can make and this one is a lot of fun. Kids love to make him and then pose him anyway they like. For the head, cut 3 different lengths of wire. I usually put a little glue on the end of the wire and then stick it in the top of the cork. Glue 2 eyes on the then paint the mouth with your colored felt pen. I have found the best way to twist the wire for the arms, legs and neck is to use a pencil or dowel. Just start wrapping it around the pencil until you have the length that you want. For the neck just put a little glue on the ends of the wire and stick one end into the head and the other end into the body. For the arms just take your wire and wrap it around the neck wire and then coil it. When you have the length that you want just wrap the wire around the cork. Do the same thing for the legs and then you have the wine cork man done. I like to have then sit down. Just straighten the wire a little at the body and he will sit down. You can make them in different colored wires and you can even add some buttons to the body to dress him up. Just use your imagination and you can come up will all different kinds of ways to make him cute.